The prospects of Ghana’s 61years of independence is minimal to its relative economic density as compared to her vast natural resources. In spite of this unprecedented abysmal performance of economic indicators, there are some few individuals’ game changers who are transforming their lives through entrepreneurial spirit of resilience and positive mental revolution of a better Ghana for all. 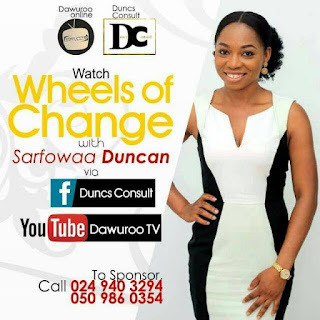 It is upon this movement of awakening to self-development, with intentions of establishing something of significance and by so doing helping others to rise up together to build a great future with inspiration to inspire commissioned Dawuroo-Tv with Safowaa Duncan to organize the wheels of change interview programme to safe guard the next generation from the horses own mouth(s). Sarfowaa Duncan is an entrepreneur, a blogger, and a brand influencer. She is the CEO of Duncs Consult, an online marketing and advertising company which focuses on Business promotions. As a blogger she is the Co-founder, columnist at Dawuroo.com and a voice over artist. She is also the producer of WHEELS OF CHANGE on Dawuroo TV. Sarfowaa is assertive, affable, and intelligent with a great sense of humour and infectious smiles. Wheels of change is a programme designed to bring to bear the processes Entrepreneurs and Change makers undergoes to get to the top. Our vision is to inspire aspiring Entrepreneurs with motivating stories and also help build and promote their brand to become an outstanding Entrepreneurs and Change makers. Become the preferred and most watched Entrepreneurial programme / show in Ghana and beyond. Entrepreneurs and young people who are also aspiring to take up the challenge to becoming entrepreneurs. Look government is doing its part but it is not enough for the country to depend on just the government, else when conditions are not favourable we will turn to blame them. Is time to stand and do something to help ourselves and the land and the key is Entrepreneurship. We dream to see the manifestation of all who will listen and watch our entrepreneurial interview videos as a source to gather wisdom and information to make their own entrepreneurial journey a fabulous story. When one finds the right source for a dream, rapid growth and expansion becomes the order of the day. Electricity current will only benefit you when you find a source to plug into it. In conclusion, on Dawuroo TV the programme WHEELS OF CHANGE we say, dream big, work hard but most of all leave the results to God and don’t forget to always pursue a dream when you have a solid source as a guide.